Designer Silver Pendant Necklace : LOVE2HAVE in the UK! A designer silver pendant and necklace for men and women. A large elongated logo pendant in a matte finish handmade from solid sterling silver. 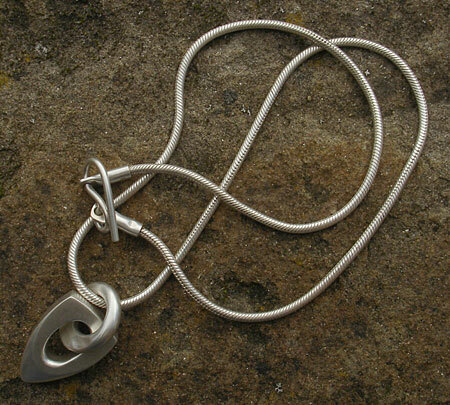 The silver pendant with its ring loop measures approximately 30mm high. It is quite a chunky piece and features a very attractive and stylised hole upon which the silver ring loop is threaded. This loop has a contemporary tapered shaping to it threaded onto the necklace itself. As pictured the necklace is made from black suede, but a silver snake one is also available. Both measure 18 inches in length. The suede comes with a designer fastening designed to lock tight. 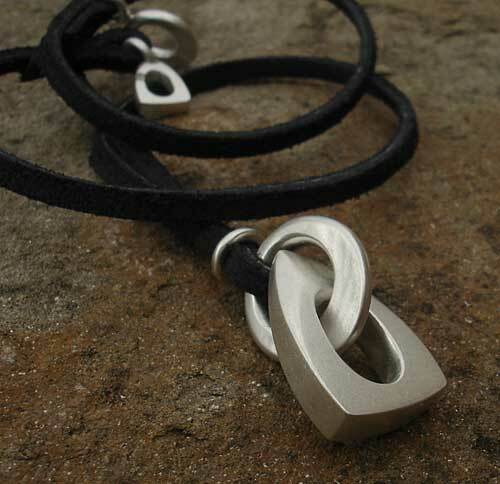 Metal(s)/Material(s) Available: 925 sterling silver and suede. Vegan non-leather also available.